summertime, please. | Anna Allen Clothing Blog: summertime, please. Hey, guys! Oh man, I am pretty much ready for summer. 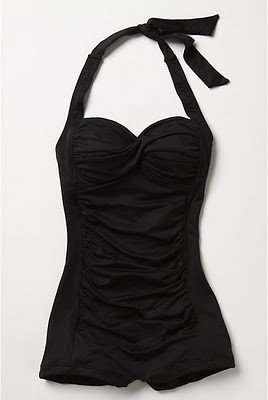 I've been coveting that bathing suit from Anthropologie. I decided that if I can sell some stuff from my closet on eBay and make enough, I'm going to get it. I don't care if it's way more than I would normally spend on a bathing suit. It's the perfect suit. I dream about it...okay not really. Anyway, I think bathing suits are on my mind because it's freaking cold here and it's only the end of January. Which means in Iowa that it's basically just the beginning of winter. Also I have taxes on my mind, which makes me want to vomit. Every year it's like this and every year I think somehow the next is going to be better. Ah, well...it's what I get for having my own business. But I guess it's worth it. Maybe one of these days I'll get organized. Speaking of organization... You know what else I've been up to? I've been cleaning my bedroom like crazy. I've spent almost two weeks up there clearing out the clutter, sweeping and generally being ruthless in what I am going to keep and throw away. I have a pile sitting in the hallway waiting to be given to some sucker...I mean, someone who wants my crap. Or I'll drop it off at a thrift store. It feels pretty good to get rid of stuff. Stuff I never use and have almost forgotten about. My new motto is, "out of sight, out of mind." And I'm trying to remind myself of this when I'm cleaning. I've been doing much more than cleaning lately, but there is way too much to tell in just one post. I will mention that I went to a Bowerbirds concert at The Mill last week and it was fabulous! I'm SUPER excited to go to see Camera Obscura in April. Really hope I don't have anything else planned on that date. Well I hope y'all have a great week! I'll be back here before too long. I'm getting rid of a few vintage inspired frocks I made and some Regency (Jane Austen) style dresses, if you're into historical attire. I'll let you know when I list them for sale. Be well! I agree with Heather. It's almost like a duty you have, now. You simply HAVE to get it! It's so 50s and classy. I'm very jealous you get to go to the Mill. It was my favorite place to hang out growing up in Iowa City, in fact we ended our wedding early to go to a concert there a few years ago. you are right, that is the most perfect swimsuit ever! okay, now I'm dreaming of owning that swimsuit! I love that bathing suit! *sigh* If only I could bring myself to save and buy a suit that expensive. haha. But you're right: it's like the perfect suit! Oh I LOVE this post! Great bathing suit pictures...That anthro suit is pretty perfect! Hi. My name is Anna Allen also, and I lived in Iowa for a number of years--small world! So I had to hop on to see what your blog is all about and I noticed this post on swimming suits. There happens to be a similar suit by Lands End that is more affordable than the Anthropology one. It's a great suit, durable and stylish (my favorite one that I own, as a matter of fact). Check it out if you're still on the hunt: http://www.landsend.com/ix/swimwear-swimsuits/Swim/Women/One-piece-Suits/index.html?seq=1~2~3~4&catNumbers=644~645~651&visible=1~2~1~1&store=le&sort=Recommended&pageSize=12&tab=6 (top row, far right). Good to sort of meet you, Anna Allen. Great blog!